Now that the high-capacity SDXC cards are available (with up to 2TB in total size), some Nikon D90 owners might be looking at purchasing 64GB+ SDXC cards for additional/expanded storage. The bad news, is that the Nikon D90 currently does not support the SDXC memory. Since the physical interface between SDHC and SDXC cards is the same, Nikon might be able to support SDXC in D90 by releasing a firmware update that can read the SD 3.0 specification. However, based on the history (specifically, the Nikon D50 + SDHC compatibility problem), Nikon probably will not address this problem and only provide support for the SDXC format on the upcoming Nikon D90 update that will be released next year. As of today, only 64GB versions of the SDXC cards are available for sale by major retailers. Higher capacity cards with up to 2TB in size and up to 300MB/second transfer rate will be released by various manufacturers in the future. After reading the SDXC news I am curious what the future of CF is (I’m a D3 user) Will newer cards/capacities still be introduced based on the UDMA standard, or will we see a phase-out of this type. Also, I had heard about differences in data reliability between CF and SD but questioned the truth of such assumptions. Any insight there? Lincoln, absolutely! Nikon and many other companies is teaming up with CompactFlash association to create faster, more reliable and much larger CF cards to be used in future cameras. They are talking about future 1TB+ sizes now and soon enough, you will see very large cards that will have lots of additional space. CF is certainly here to stay! As far as data reliability, I believe manufacturers will still push CF to be more reliable than SD, although SD has been making a lot of good progress during the last several years. I believe CF is still going to be the gold standard for pro-level bodies, while SD will be a good alternative for such things as recording video. Just to let you know. I own a 64gb card SDXC card as shown above, and it works fine in my Nikon D90. I am very impressed, good speed for continuous mode. It will take over 4,000 photos in RAW. Could you please send me the product code of the card you are using? Nasim, yes it’s definitely working in my D90. It is the exact card as shown above in the image on the original post. I’m not sure what you mean by product code, but I can show you the barcode number from the box that the SDXC card came in if you like? This sounds really promising. Thanks! My XC card also works in my D90–but only for stills, not video. Damien, I have the same issue too. XC card only works for stills and not video. Are your D90 and the SDXC card still playing well together? I’d love an update. :) Thanks! Yes, very well thanks! The card hasn’t let me down. I use it for a variety of devices now, two different DSLR’s, the D90 and the D3100. I also use it to backup important info and it also works very well as a large USB removable disk! Let me know if have any more questions! do you guys know if SDXC works with Nikon D80… ??? Not sure if it works on D80, but if I come into contact with one I will be sure to try it out and let you know! Isaac, my Lexar 64SDXC card works in my D90 TOO, to take photos, BUT it WON’T record video. Any luck with yours? Anyone has the same success/ prob? Hi! Yes I have the same problem! Not sure why this is, must be something to do with the age of the D90’s. It dosen’t bother me too much though. How are you getting on with the card? This card works in my D90 for photos, but not for videos. Do you have any issue with videos? How do you know there will be an “upcoming Nikon D90 update that will be released next year.”? I would think the card pictured would have a hard time with video because it’s a class 4. Minimum is class 6 for HD 720. I try not to buy anything under class 10 (the highest you can buy). Hi, I write from Italy, I would be too interested in this memory, if kindly can you tell me the , you would be grateful. 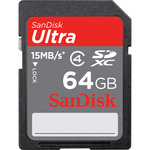 I wish I would have read this before I bought a SanDisk Ultra SDXC 64 gb for my Nikon D90. Have they came out with an update yet? Mine will not work dangit. Try formatting the card Within the D90. That worked for me. I use it all the time. I did format in the D90, it didn’t work. Thanks though. I have a SanDisk 64gb micro sdxc which works fine using a generic sdhc adapter in my Nikon D80(!) – you just need to make sure you format it with Fat32Format. Freshly formatted and placed in my camera, the D80 reports 8.5k image capacity! Having just purchased a Transend SDXC UHS-1 64gb class 10 card, it to excepts photos but not video, but it is slower and the buffer slows to a halt much quicker than my old Lexar 8gb SDHC class 6 card..
Not sure why this could be. my 64 works fine with pictures and video on my d90.. I didn’t even realize that I wasn’t supposed to use them until a friend told me.. its’ really all ive used for the last couple of years..
is this update out already? I want to buy this card for my D750 and I wonder if it would also work on my D90? SanDisk 64GB micro SDXC, picture ok but no video. SanDisk 32GB extreme micro SDHC, picture and video ok, good speed too…Nikon D90. Does anyone know if the new D90 firmware update can be used in a D80? Nikon has not updated the D80 firmware since 2007 I believe. This is super helpful and I’m assuming that it’s also true for my old D80. I got a SanDisk 64GB Class 4 SDXC, formatted it in the camera, and the top info window told me it was “full” – read “full”, also would not calculate the number of shots available, nor allow me to take a picture. Put the card in my computer and it was formatted properly for the Nikon camera format, just like the old cards were. Thought it might be a bad card, so I did an exchange with the same results. Do you know if any of the D80 firmware updates address this? I can only seem to find info for the most recent one, which involves some sort of error when trying to take a picture, not accommodating new memory card technology. Been dealing with this problem myself recently. I bought the sandisk 128gb card before Christmas. It would not take video. I have a d90. I did the firmware update, but it did not make any difference. After some research and contacting Nikon about the compatibility chart being a couple of years old, it seems that (according to the email received by Nikon) this is the most up to date info. Also, just FYI, both of the new as cards are 80 and 95mb/s. Supposedly the speed doesn’t make a difference. I have a few Sandisks 32GB card working without issue on my D90, but one generic (MicroCenter) 64GB sdxc formated in camera work just for about 10-30 pics and than its stops. Have not try any brand name SDxc card yet.